Cleaning your carpet is one thing, but what are you supposed to do when it comes to your large area rugs? At Steam Master Cleaning and Restoration, we are qualified to work with a variety of different area rug types, giving them our detailed care and expert attention. Talk to us today about scheduling area rug cleaning services in San Antonio or surrounding locations. 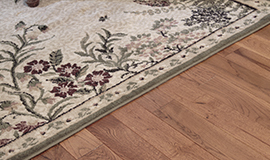 Just because your rug does not cover your entire floor area, that doesn’t mean it should be ignored. Whether it is in the living room, the dining room or by the entrance to your home, your rug experiences traffic that tracks dirt and dust into your home. While this dirt may not always be visible, it is important that you hire experts for area rug cleaning so you can maintain its quality and ensure its beauty lasts as long as possible. Used as an accent piece, we understand that you want your rug to stand out in your home for its beauty, not for the huge stain in the middle of it. Using a detailed process, we treat and clean your rug ensuring that it not only looks but feels as good as new too. We pride ourselves on our years of experience and believe in taking care of our customers because that is what they deserve. At Steam Master Cleaning and Restoration, you can trust us to thoroughly clean your rug, leaving you with results like you’ve never seen before. The more we can do to make cleaning easier for you, the more successful we feel. Get your Speedy Fast™ Bid now and let us handle your rug cleaning services in San Antonio.